There’s plenty of excitement in the film. Johnson struggles to portray and unsure and vulnerable character in this terribly uneven film. 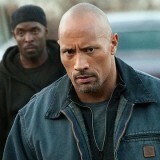 It probably wasn’t the best decision to cast tough guy Dwayne “The Rock” Johnson at the lead in Snitch. Johnson plays John Matthews, a truck-driving father who tries to get his son out of prison by becoming an undercover informant. Johnson is a hulk of a man who looks like he could tear the head off just about anyone. John, on the other hand, doesn’t know a thing about the world of drugs and guns. He lives in the suburbs with his family and gets more than he bargained for when he tries to take down the local cartel. John is particularly unsure and vulnerable, and Johnson certainly struggles to portray that side of his character in Ric Roman Waugh’s terribly uneven film. The film’s plot centers on the drama that unfolds after John’s son Jason (Rafi Gavron) is nabbed after one of his friend’s sends him a box of illegal narcotics. Apparently, his buddy could get a reduced sentence if he ratted out one of his friends and Jason happened to be that scapegoat. John meets with U.S. Attorney Joanne Keeghan (Susan Sarandon) and strikes a deal. If he can bring down a local drug dealer, she’ll reduce his sentence. John accepts the terms and enlists his employees, the ex-con Daniel (Jon Bernthal), to introduce him to local drug lord Malik (Michael Kenneth Williams). John’s first assignment: drive a semi down to the Mexican border and pick up a load of drugs to take back to Malik. The drug run doesn’t go smoothly, yet John somehow escapes and even seems to impress the higher-ups in the cartel. There’s certainly plenty of excitement in the film. John is an underdog that you can’t help but root for, even as he finds himself in the middle of some incredible jams. But Johnson is such a limited actor, he can’t carry the film, and the supporting cast doesn’t do any better (Sarandon in particular really phones it in). Though it’s based on a true story, the movie appears to have manipulated the details to the point that it just seems preposterous that this truck driver would be able to elude the bad guys in a high-speed chase and return their fire to the point that even the cops are impressed with his aptitude. Of course, we wouldn’t put any of that past The Rock. But John Matthews? Now that’s another story.